The EUROPattern Microscope is a high-performance automation solution designed for the evaluation of immunofluorescence slides in autoimmune diagnostics. EUROIMMUN produces reagents for medical laboratory diagnostics, focusing on test systems for the determination of various antibodies in patient serum in the diagnosis of autoimmune diseases, infectious diseases and allergies. The test methods employed are predominantly indirect immunofluorescence, microplate ELISA, various blot techniques and all molecular biology techniques. The company is one of the world’s leading manufacturers of medical laboratory diagnostics. EUROIMMUN was founded in September 1987, and has its headquarters in Lübeck, Germany. At present EUROIMMUN has 1135 employees in Germany and 1581 worldwide. Over 6,000 laboratories worldwide use EUROIMMUN diagnostics. Indirect immunofluorescence is an indispensable technique for autoimmune diagnostics. Immuno-fluorescence is used for light microscopy with a fluorescence microscope, primarily on microbiological samples. This technique uses the specificity of antibodies to their antigen to target fluorescent dyes to specific biomolecule targets within a cell, and therefore allows visualization of the distribution of the target molecule through the sample. 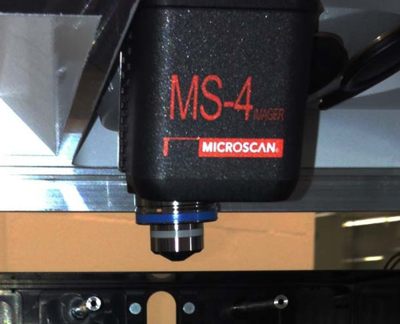 Microscan’s MS-4 imager is integrated inside the EUROPattern Microscope. Indirect immunofluorescence uses two antibodies; the unlabeled first (primary) antibody specifically binds the target molecule, and the secondary antibody, which carries the fluorophore, recognizes the primary antibody and binds to it. EUROIMMUN has developed several innovations for the standardization and modernization of this technique, such as an activation technique, where physically or chemically activated cover glasses are coated with cultured cells or tissue sections. Frozen tissue sections are fixed to the glass surface by covalent bonding, increasing adhesion more than 100 times and thus preventing the substrates from being detached. In their BIOCHIP Technology, cover glasses coated with biological substrates are cut into millimeter-sized fragments (BIOCHIPs) on a machine. This makes it possible to obtain 10 or more first-class preparations of homogeneous quality per tissue section, in the case of cultured cell substrates even several thousands. However, the evaluation of these samples is time- consuming and demands high proficiency from laboratory staff. 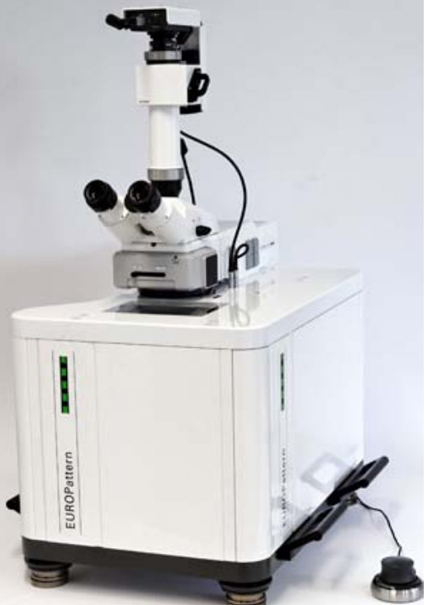 In order to provide diagnostic laboratories with maximum support, EUROIMMUN has developed EUROPattern, a computer-aided system for recording immunofluorescence images and – in the detection of anti- nuclear antibodies – for largely automated evaluation of indirect immunofluorescence tests. The MS-4 imager decodes the Data Matrix code on the microscope slide inside the EUROPattern Microscope. The EUROPattern Microscope is a high-performance automation solution designed for the evaluation of immunofluorescence slides in autoimmune diagnostics. The patterns and corresponding titers are automatically identified and given for each patient individually (including mixed patterns). Validation and export to laboratory information systems (LIS) are carried out with just a mouse click using the EUROLabOffice (ELO). The EUROPattern Software enables automated image acquisition of tissue sections. 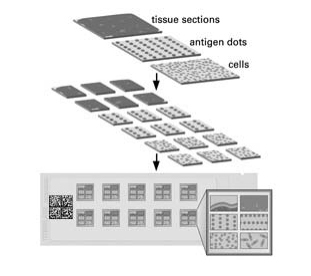 In order to enable automated identification of the microscope slides containing the substrate, EUROIMMUN prints a 2D Data Matrix code during production on each slide using a specialized inkjet printer. This code contains information such as the lot number, unique identification and best-before date. Each microscope slide needs to be identified reliably and efficiently when they are being analyzed under the microscope. EUROIMMUN contacted beic Ident GmbH, a Microscan value added reseller based near Hannover in Germany, to find the perfect solution. They opted for Microscan’s MS-4 imagers, which are integrated inside the EUROPattern Microscope. The MS-4 barcode imager is designed specifically for embedded barcode applications. Its ultra-compact size and wide-angle optics provide the widest field of view available for reading any symbol at close range. It is the ideal barcode imager for OEM design engineers who need to read 2D symbols with 100% data integrity. The small size of the MS-4 allows flexible positioning in tight spaces. It has an extremely wide field of view and reads linear codes or 2D symbols as close as 25 mm. 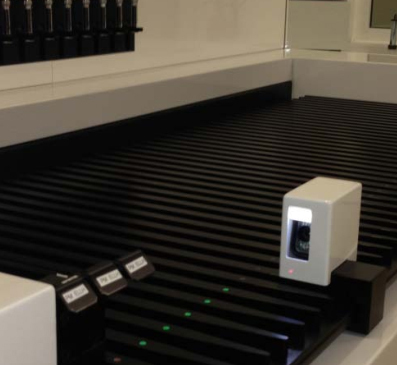 The newly designed EUROPattern Microscope can automatically process up to 500 application spots in succession (10 carrier plates with 5 slides containing 10 sample fields each). The mechanical stage moves into a magazine for 10 carrier plates, selects one of them and places it accurately below the objective. After calibration, the MS-4 imager decodes the Data Matrix code on the microscope slide. The microscope drives to the substrate positions, autofocuses and takes images of the preparations by means of a camera. The software developed by EUROIMMUN transmits the images and the results into the laboratory information system. Thanks to the Data Matrix code, each sample and image is linked to a patient ID ensuring accurate and reliable processing, as well as reporting of the results per patient (consolidation of single results), archiving of images and results, as well as access to patient history. Diagnosis can be made visually at the screen or, in problem cases, results can be verified retrospectively directly at the microscope. For this, EUROPattern Microscope selects the relevant substrate positions at the push of a button. “Thanks to the integrated barcode reader, we have been able to eliminate several manual steps, and fully automate the process,” said Stephan Machnik, qualified medical engineer responsible for new analysis techniques at EUROIMMUN. This increases efficiency of the laboratory staff and reduces errors. “We have been very happy with the support provided by beic Ident GmbH and Microscan, as well as the performance of the scanners,” Mr. Machnik concludes. EUROIMMUN has also integrated the compact MINI Hawk imager in their new EUROLabLiquidHandler. EUROIMMUN has also integrated Microscan’s compact MINI Hawk imager in their new EUROLabLiquidHandler, for intelligent pipetting. The MINI Hawk ensures rapid and complete data collection of samples, reagents and accessories through minimized “hands-on” time. The MS-4 and MINI Hawk are ultra-compact barcode imagers ideal for reading 2D symbols in tight spaces. Omron Microscan is a global leader in the design and manufacture of Machine Vision, Auto ID and Verification solutions. From product inspection to robotic guidance to barcode and direct part mark decoding, Omron Microscan products serve a broad range of applications and are recognized worldwide for high quality and leading technology. Omron Microscan is a business unit of OMRON Corporation. The inevitable Internet of Things is already taking shape, absorbing the world of consumer devices and hovering on the horizon of industrial manufacturing. Using machine vision inspection with high-performance Gigabit Ethernet (GigE) cameras, ISW GmbH designs turnkey hardware/software solutions for the pharmaceutical industry to specifically ensure accurate dimensions and fill levels of ampoules in production, replacing error-prone manual quality control processes. Understanding an applications requirements is critical in choosing the best device for successful data acquisition.